The Vice President, Shri M. Venkaiah Naidu presenting the 14th Shailikaar Prabhakar Samman award to Smt. Anuradha Prasad, in New Delhi on September 24, 2017. The Union Minister for Human Resource Development, Shri Prakash Javadekar is also seen. New Delhi: The Vice President of India, Shri M. Venkaiah Naidu has said that the media has to avoid sensationalism and maintain its credibility while disseminating news. He was addressing the gathering after presenting the 14th Shailikaar Prabhakar Samman Award to eminent journalist Smt. Anuradha Prasad, here today. 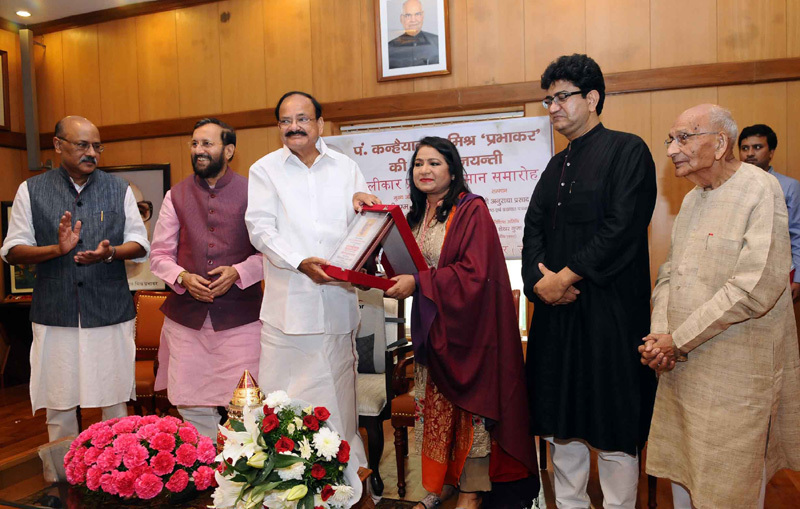 The award was instituted in memory of well-known Hindi writer, journalist and freedom fighter, Pt. Kanhaiya Lal Misra ‘Prabhakar’. 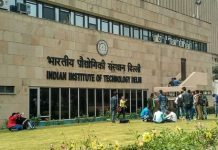 The Union Minister for Human Resource Development, Shri Prakash Javadekar and other dignitaries were present on the occasion. The Vice President said that the credibility was the most important thing in journalism and said, “Information with confirmation is more than ammunition”. He further said that any content that offends the sensibilities of the people was a matter of concern and self-regulation was the best way to address such a problem. 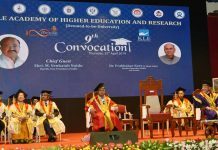 Recalling the pioneering role of journalism in freeing India from colonial rule and subsequently in strengthening democracy in post-Independent India, the Vice President said that a vibrant electronic and print media were continuing to play an important role in moulding public opinion. He further said that news values appear to have changed over the years. What would not have been considered to be even a filler in the past was becoming ‘Breaking News’ today and many a time, an off-the-cuff remark becomes a screaming headline, he added. Asserting that he was not advocating any censorship, the Vice President pointed out that the media because of its reach and impact has a huge responsibility in ensuring that the people were not swayed or agitated by controversies which are best ignored. He further said that the cinema too must avoid obscenity, vulgarity, violence and double meaning dialogues. Of late there was a tendency of mixing news and views, he added. Referring to freedom of expression, the Vice President said that it is best utilized when the value of such freedom was fully appreciated. He called upon newspapers and channels to refocus on developmental journalism so that different social and economic issues affecting the people and the country get highlighted and even bring about policy changes at the highest level. Development journalism was all the more relevant in a country like India to unravel various complexities and put things in the right perspective, he added. The Vice President said that we need to accord importance to mother tongue, while pursuing English as the link language. Describing various Indian languages including Hindi, Telugu, Tamil, Malayalam, Assamese, Oriya and Gujarati as national languages, he said that proficiency in the mother tongue was vital before learning other languages.